Looking for new solid wood tables and chairs? Visit the showroom of Trithi Company, located on McVey Avenue in Lake Oswego. A new business in Lake Oswego's Palisades neighborhood could easily become a household name. That's because Trithi Company's products are something every household and business can use: indoor furnishings. 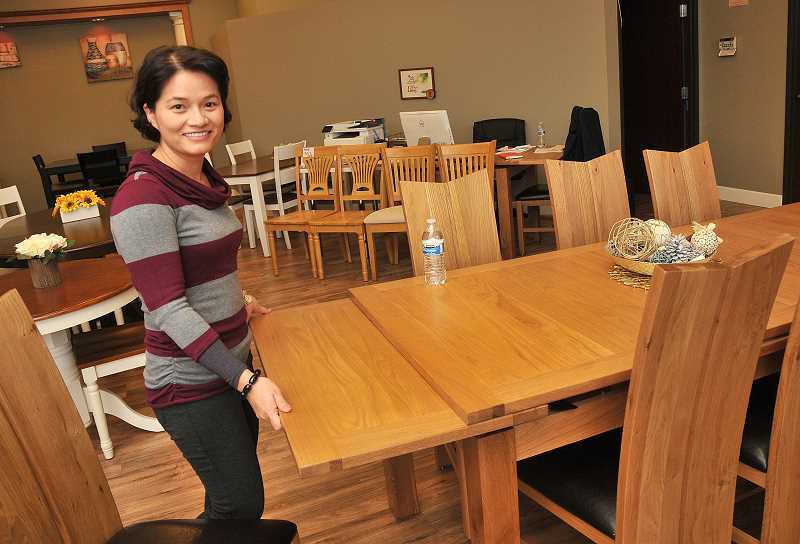 The company has opened a showroom on McVey Avenue to market its solid wood tables and chairs and promote the rest of its high-quality solid wood indoor furniture and cabinets. 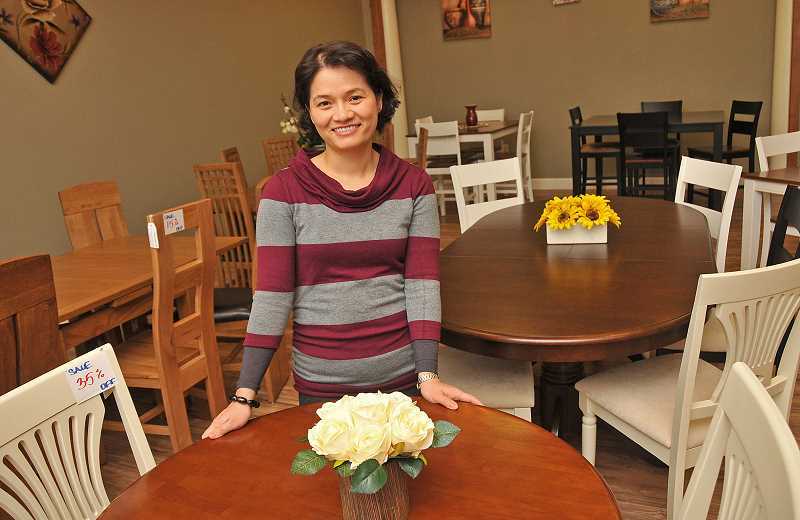 Trithi Company is owned by the Lake Oswego husband-and-wife team of Trinh Huu Bui and Kim Thuy Duong. They select the highest-quality hardwoods found in the United States and Asia and ship the materials to Vietnam to be manufactured into dining tables, chairs, cabinets, headboards and more — and then import the furniture to the U.S. for sale. "We buy wood from locations across the United States to manufacture furniture in Vietnam," said Bui. He has been involved with woods and furniture manufacturing for 30 years, selling primarily online on Amazon.com and Trithi Company websites trithi.com and oaktreefurniture.com. Trithi Company was founded and opened its first warehouse in Portland in 2015. The Lake Oswego showroom, located at 1179 McVey Ave., was opened in October 2017. A California showroom is planned in 2018. The company has patents pending on its designs of modern and contemporary furniture, which are sold all over the world to hotels and restaurants — including Olive Garden — as well as building contractors and other home décor businesses. Custom orders are a regular part of their business. Bui says the furniture is made of solid wood, such as oak from the U.S. or rubber tree wood from Asia. Rubber wood has characteristics like pine, he says; it's lightweight but denser than pine. All woods used in Trithi furniture are sustainably grown. Bui stresses that the furniture is solid wood, not a wood veneer over plywood, so it is sturdy. "It's not going to crumble with use," he said. Bui and Huong have children attending school in the Lake Oswego School District and have already introduced themselves to the community, but they say they're looking forward to broadening their network. They invite all to stop in, meet them and view the furniture. Showroom hours are Monday through Friday, 10 a.m.-7 p.m.; and Saturday, 10 a.m.-3 p.m. Call 503-997-4387 or visit trithi.com for more information.